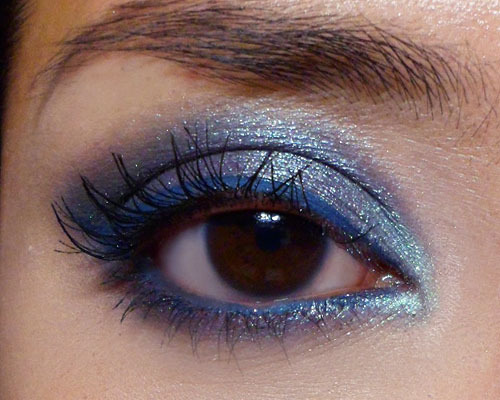 This is a fun evening eye made up of several blues. Navy blue crease (The Body Shop Eye Shadow Single in #31), metallic seafoam-grey lids (Cyber Colors Cosmos Eyeshadow #01 Neptune), and a gorgeous matte prussian-blue liner (Stargazer Electric Blue Cake Liner - though it's not really electric blue) which costs all of £3.50. The hardest item to obtain or duplicate would be Cyber Colors Cosmos Eyeshadow #01 Neptune (available at Sasa boutiques around Asia), which is a gloriously unique baked shadow made up of swirls of gunmetal, silver, and teal. I tried and tried but couldn't find any substitute. The closest would be to mix an iridescent teal shadow with a metallic grey. Step 1: After applying a base, brush on a deep navy blue shadow in the outer V of the eye and smoke along the socket line (above the crease). Step 3: Using a pencil brush, run the shadow along the lower lash line as well. Step 5: Finish with mascara for the final look.